Persistently being channelized by rigorous technological breakthroughs, the penetration of IoT in manufacturing industry has triggered a consequential transformation in the production landscape of major end-use sectors with regards to operational efficiency, supply chain management, asset tracking and safety & security. While having a reputation of practically revolutionizing almost every business spheres, the dynamic impact of IoT in manufacturing space seems to be a rather profound one. Statistics further affirm the aforementioned declaration- the overall IoT in manufacturing industry size in the year 2016, was almost USD 27 billion. Needless to say, influence of technological breakthroughs and innovations has played a pivotal role in proliferating the industry trends, enabling a seamless connectivity of all devices and systems involved in the plant and ensuring an optimized operational process. The potential for cyber-physical systems to improve productivity in the manufacturing process is vast, a fundamental aspect that can be credited for IoT in manufacturing industry proceeds. The Internet of Things, quite evidently has set in motion the idea of fourth industrial revolution (Industry 4.0) with the influx of a new array of technological advancements that primarily focus on decentralizing the production control and maximizing the industrial throughput. As IoT provides the foundation for an automated data acquisition, manufacturers have been increasingly leaning toward integrating digitization in processes, not only for bringing incremental improvements in their product line, but also for a consequential transformation in the business models. The behavioral shift has been quite prominently noted across major end-use domains of IoT in manufacturing industry such as automotive, pharmaceutical, machinery, and food and beverage sectors. Citing an instance of the influence of IoT in manufacturing market, in 2016, two of the world’s top-notch leaders namely Barack Obama and Angela Merkel, inaugurated world’s one of the largest trade fairs, Hannover Messe. Allegedly, the main theme of the industry was fourth industrial revolution or Industry 4.0. Needless to say, the massive recognition engrossed by Industrial 4.0 on a global platform, undoubtedly indicates the extensive penetration of IoT in manufacturing industry and its lucrative future potential. 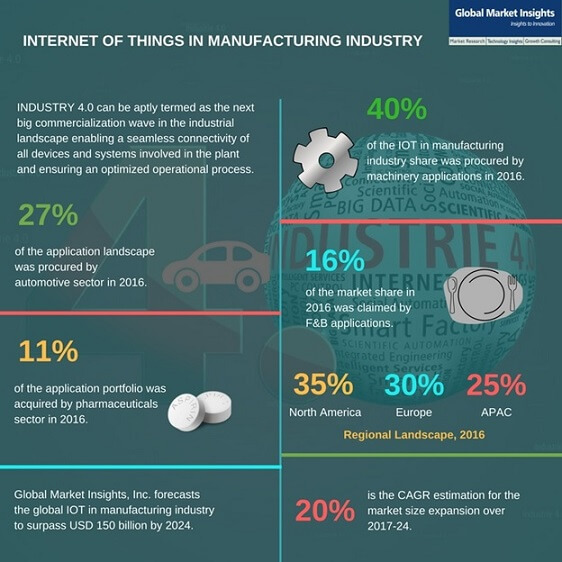 The penetration of IoT in manufacturing industry has led to a renewed realm of connectivity, where each and every operation is interconnected. The paradigm shift in occupational interlinking has allowed the manufacturers to enhance customer satisfaction with a better service channel and improved product performance. As per reliable estimates, overall device management procured almost 40% of the overall industry share in 2016, and considering the growing preference of using product-as-a-service, the coverage is likely to upend in near future. In a bid to harness the power of IoT in manufacturing market, some of the renowned progressive manufacturers have already integrated innovative services such as digitization of ongoing maintenance, assisted operations etc. Citing another instance where utilization of IoT in manufacturing industry has left an unparalled impact – the paint manufacturing sector. The paint manufacturers offer continuous supply of white paint to automotive OEM, based on real time plant inventory and production schedules. • Monitoring actual product performance and creating detection signals by providing closed loop feedback. • The integration of advanced services that is expected to leverage substantially higher margins and greater customer satisfaction levels. Having recognized the potential of IoT in manufacturing market, experts have enough reason to believe that Internet of Things will phenomenally sway the future supply chain models. Today, manufacturing is not just about producing goods, but is also about economics of supply and demand, product benchmarking, application scope, customer engagement, and subsequently value chain. A substantial improvement has been observed in the supply chain, with the adoption of advanced sensors like GPS, RFID, with regards to inventory control and better tracking of warehouse assets. Technological proliferations have profoundly narrowed the gap between developed and developing nations, offering IoT in manufacturing market players lucrative opportunities to expand their geographical reach. In this regard, it is prudent to mention, that of late, one of the most intriguing aspects that has led to an extensive penetration of IoT in manufacturing industry is the increasing demand for faster delivery. As per estimates, a larger fraction of the manufacturers today explore the feasibility of logistics networks to ensure accelerated delivery for certain selected products. Statistics further validates the fact, which claims that network management procured almost 25% of the overall IoT in manufacturing industry share in 2016. Experts claim, two basic proficiencies that must be integrated in the system to modify the value chain are reproducibility and stability. Asset tracking is another latest disruptive trend infused by IoT in manufacturing industry to ensure a sound supply chain management. Despite the fact that the term ‘asset tracking’ is not new to the industry, the advent of advanced IoT technologies have enabled it to gain a new attention. Today’s advanced asset tracking solutions provide organizations a complete way to totally renovate their supply chain and logistics operations. And the transformation is already underway. As per a recent survey conducted by two of the big shot giants like Capgemini and GT Nexus- almost 70% of the manufacturing and retail companies have already started the digital transformation in their logistics operation and supply chain model. The aforementioned statistic undoubtedly manifests the profound impact of IoT in manufacturing industry. The growing inclination toward smart manufacturing justifies the growth potential of IoT in manufacturing industry. Smart manufacturing practices require IoT driven data analytics for asset utilization and improved efficiency. Integration of digitization in manufacturing space has opened up new scope of applications for sensors, equipment I/O data, and actuators, thereby offering immense business opportunities for companies involved in IoT in manufacturing market. In this regard, it would be prudent to mention that global competition and increased consumer demand have pushed the manufacturers to remodel their production line, a factor that has made effective floor management all the way important. Combining old and new data with analytics driven insight is expected to provide the manufacturers the required degree of flexibility and decision-making capability to combat with supply demand variation and market complexity. In order to exploit the utmost potential opportunities of smart manufacturing, experts claim, it is essential to incorporate an intelligence layer that integrates shop floor with executive suite- providing real time analytics for decision making in an all in one integrated system. While the potential of IoT in manufacturing market place is claimed to be humongous, there are a couple of factors that has proved to be deterring for the business growth, interoperability and security concerns being at the pinnacle. Legacy systems associated with the process involve different protocols that doesn’t allow a seamless interoperability. It is deemed to be an intriguing challenge for the players involved in IoT in manufacturing industry, subject to the fact that it is not only about deploying a new technology, but also require a new operational blueprint for the overall business model. However, having recognized the immense potential of this tech prodigy, there are some renowned giants who have been increasingly vying up with one another to unveil its true potential. For instance, HIROTEC Corporation, a universally recognized manufacturing equipment and automotive parts supplier has recently made to the headlines with its official announcement of incorporating PTC’s ThingWorx Platform for closely monitoring the factory operations, in a bid to improve the operation efficiency and factory facilities. Reportedly, after experiencing an exhaustive due diligence process, HIROTEC has selected ThingWorx for the latter’s rapid application enablement, machine learning capabilities, and excellent ability of device-to-cloud connectivity. Speaking of competitive profiling, strategic partnerships and joint ventures are another important growth tactics that seem to be quite prominent in IoT in manufacturing industry. The recent partnership of SAP and VMware for exploiting the Internet of Things across myriad industrial projects can be placed as another testament to the aforementioned declaration. Reportedly, the cloud solutions provider had also unveiled its plan to explore Blockchain technology, where it would make Blockchain-as-a-service a viable option for IoT in manufacturing industry behemoths. For the records, the company has collaborated with Capgemini, NetApp, and Deloitte to integrate blockchain in different system protocols. The proliferation of IoT in manufacturing industry is sure to witness a remarkable escalation over the coming years, given the incessant efforts by the market giants to unlock the immense possibilities of IoT and analytics that have, of late, become more insight-driven. In addition to this, with the increasing demand for productivity improvement, performance enhancement, and quality upgradation, companies are readily mobilizing IoT in manufacturing market. Looking at the pace of advancements in technology driven manufacturing innovations, experts claim the IoT in manufacturing industry to be one of the most fascinating business spheres to watch unfold. Global Market Insights, Inc., forecasts the overall industry share to witness a phenomenal CAGR of 20% over 2017-2024.